Hyde Park was the home of Franklin Roosevelt. 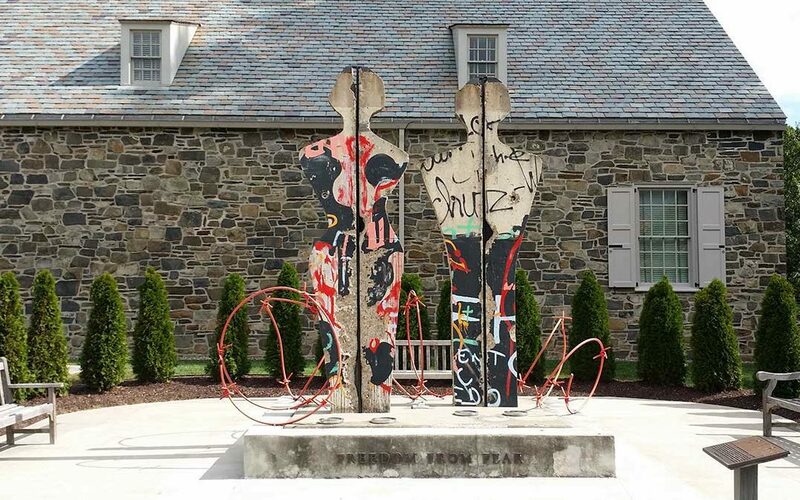 Outside the Presidential Library, in the Freedom Plaza, is BreakFree, constructed of pieces of the Berlin Wall (which fell in November, 1989.) It was installed in 1994. The sculpture is by Edwina Sandys, granddaughter of Winston Churchill. The sculpture shows the figures of a man and a woman emerging from symbolic, giant barbed wire, expressing Man’s irresistible quest for freedom. It stands on a podium inscribed around the base with Roosevelt’s ‘Four Freedoms’ as articulated in his 6 January, 1941 State of the Union Address: freedom of speech, freedom of worship, freedom from want and freedom from fear. Sandys carefully saved the cutout pieces from a 1990 art installation, “BreakThrough,” at Westminster College in Fulton, Missouri (video below.) It was here in 1946 that Churchill gave his famous “Sinews of Peace” speech in which he claimed that “an iron curtain has descended across the Continent.” Out of range in this photo, in front of “BreatFree,” is a bronze bust of FDR, installed in 1945 and a facing bronze bust of Churchill, installed in 2007 at the urging of Sandys.